Chris Rybak demos Roland FR-7 V-Accordion, performs on Alaskan Cruise May 30 - June 6, 2007, performs at Texas Renaissance Fest Oct. - Nov. 2007. Europe Tour June 16 - 28, 2013 SOLD OUT! France (Paris & Normandy), Luxembourg, Germany (Rudesheim, Furth) & Czech Republic (Prague, Karlovy Vary & Frenstat). Europe Tour September 15 - 27, 2013 SOLD OUT! LOTS OF MUSIC, PARTIES, OKTOBERFEST, SCENERY, KOLACE AND SLIVOVICE!!! Hallettsville Hunting Expo March 3-4 2012 ... fishing guides, guns, taxidermy, dog food, a number of hawg & dawg accessories, jerky, night lighting, jewelry, trucks & autos, tractors and buggies, knives, camo caps and apparel, antiques, crafts, toys, duck calls, blinds feeders, a real western artist and on and on� Musical guests will include The Accordion Cowboy- Chris Rybak, The Trevor Cobb Band and Scott Brunner Band � all with Hallettsville ties and followings. Music outside the historic beer stand from 4 to 7:30 p.m. will feature all Star Entertainment, and outside the bingo stand pavilion from 7:30 to 11 p.m. Chris Rybak is the featured performer. the Emotions and Honeybrowne will play inside the hall from 9 p.m. to 1 a.m. with an admission fee. A country ... Sacred Heart Parish Spring Picnic will be held at the K.C. Hall in Hallettsville. Dinner will be served ... Navigation: � Help with trying to find artist and song name of this rap! Chris & Edita Rybak toured Europe with a busload of fans and friends! This Europe tour included Austria, Czech Republic & Germany. Lots of music, parties, scenery, kolaches and Slivovice!!! Chris Rybak toured Europe with a busload of fans and friends again! Europe tour included Austria, Czech Republic, Germany, Liechtenstein, & Switzerland. Lots of music, parties, scenery, kolaches and Slivovice!!! NPR (National Public Radio) just aired a program about accordion music in Texas ... mentioning some great accordion players with various styles of music. They interviewed me as well and you can have a listen at this link. A loud, party-friendly "orchestra in a box," the accordion spread like wildfire across Texas after German and Czech immigrants brought it to their dance halls. Out of the polka came styles like conjunto and zydeco. Wade Goodwyn reports on where the instrument stands today in the Lone Star State. Edith Kneupper gave us a brief tour of her trip to Poland and the Czech Republic with accordion star Chris Rybak. There were many other Texans on the trip including SAAA member Rambie Briggs from Austin. Edith said the trip was absolutely wonderful and she thoroughly enjoyed the tour. She met many new friends on her journey and has lots of great memories. Ask her about her trip. Chris & Edita Rybak organized the tour group. 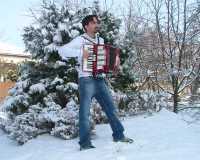 Rybak is well-known for his Texas-Czech accordion style which he couples with lots of other styles including Tex-Mex. His new single Shiner Time is doing well on the Texas tours. You can find his latest schedule and buy CDs or other memorabilia. I think Edith is looking forward to another trip! Read about how Chris, Edita and guitar-playing friend, James, received inspiration from the Shiner Brewery staff as they brewed up the new song, Shiner Time at polkabeat.com—Promoting Chris and the Texas polka music scene. "Polka music is happy music. You just can’t be down when the band begins to play." Chris & Edita Rybak toured Europe in July with a busload of fans and friends! Chris & Edita Rybak toured this July 4 - 16, 2010 5 amazing countries in Europe - Germany, Czech Republic, Poland, Slovakia, and Hungary! Joining them on this fun-filled adventurous trip was a busload of fans and friends from all over Texas. While touring, they enjoyed the beautiful scenery, learned new traditions, and even researched where their ancestors came from. The trip featured delicious cuisine, Czech Beer and Kolaches, unbelievable scenery, and music on the accordion ... along with sing-a-longs. February 14 - 21, 2010 - WOW! What a party we had on our Valentine Polka Cruise! Who knew we could have sooo much fun on a cruise?!? Well, we took about 200 of our fans and friends, brought some accordions and slivovice, and rocked the Caribbean for 1 week. We stopped by Jamaica, Cayman Islands, and Cozumel, Mexico ... had rum, beer, and tequila ... and lots of activities including dances, Taroky, dominoes, dance lessons, jam sessions, sing-a-longs. And for entertainment ... Chris & Edita Rybak, Bernard Tupa ... and special guests from Slovakia (Edita's schoolmates) - Lucia and Renata! So when is our next cruise? Stay tuned and keep watching! 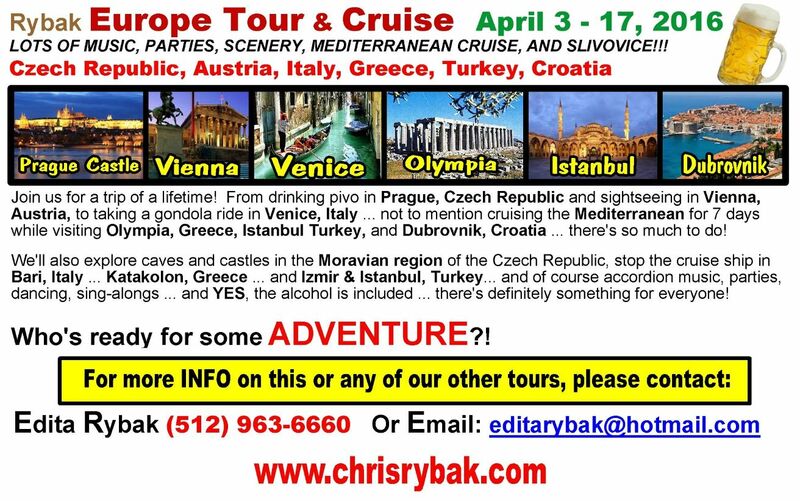 Call Edita Rybak (512) 963-6660 to be contacted for the next cruise! June 2009 - Chris & Edita Rybak toured Europe with a busload of fans and friends! Chris & Edita Rybak toured 5 amazing countries in Europe - the Czech Republic, Austria, Germany, Italy, and the Vatican. The trip featured delicious cuisine, Czech Beer and Kolaches, unbelievable scenery in the Alps, and music on the accordion and trumpet ... along with sing-a-longs. Some of the cities they enjoyed visiting were Prague, Zlin, Vizovice, Vienna, Venice, Rome, and the Vatican. They were able to get special passes through the Czech Consulate to be up close to the Pope sitting on the same platform and being arms reach from his Pope Mobile. While in the Czech Republic, they planned parties for everyone each night. The most outstanding included a dinner boat cruise on the river Vltava in Prague and a special dinner and dance in Vesela, where they had a wonderful dinner and music by the famous Veselanka Band. Here they celebrated with dancing and drinking the famous drink from this area called Slivovice. Chris played his accordion at all parties and stops along the entire trip, which included singing and dancing by all. Another highlight of the trip was when the travelers got to meet Edita's family and friends in Europe. Interested in a future European Tour? Contact Edita at (512) 963-6660 or editarybak@hotmail.com for more info. July 2008 - Chris & Edita Rybak toured Europe with a busload of fans and friends! 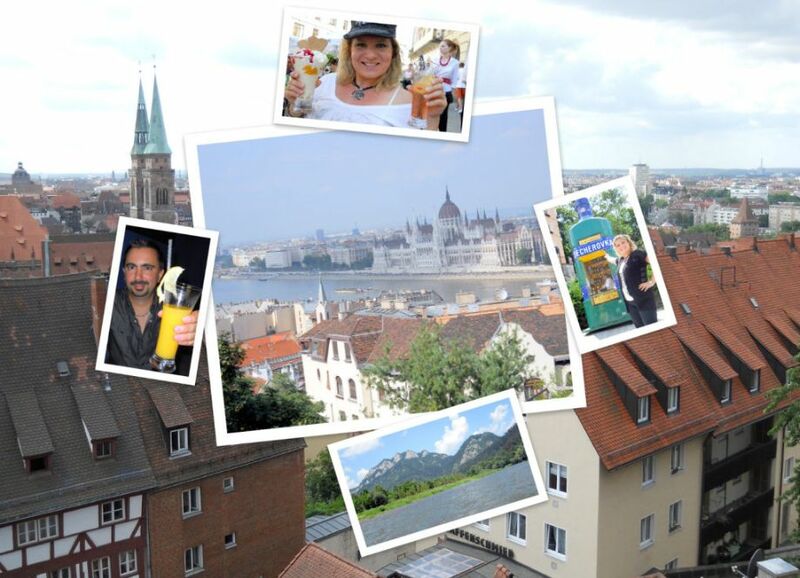 Chris & Edita Rybak toured 5 amazing countries in Europe - Hungary, Slovakia, Czech Republic, Austria and Germany. They were joined on this fun-filled adventurous trip with a busload of fans and friends from all over Texas. While touring, they were able to enjoy the beautiful scenery, learned new traditions, and even researched where their ancestors came from. The trip featured delicious cuisine, Czech Beer and Kolaches, unbelievable scenery, and music on the accordion and trumpet ... along with sing-a-longs. A new DVD is now available from this trip called European Tour 2008! You will feel like you're on the bus with everyone ... touring around Europe! So grab your copy, along with a Pivo, and Czech it out! 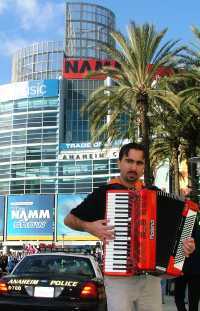 Chris exhibited the Roland FR-2, a new model in the series of "the world's first" completely digital accordions, at the Nashville Convention Center from June 20 - 22, 2008. Click to watch the accordion video! From Jan. 1 - 25, 2008, Chris & Edita Rybak travelled across Europe, first visiting England for the Baptism of their Nephew Jason, and then checked out the scenery in Amsterdam and Brussels along the way. Next stop was then the Czech Republic and Prague to try out some of their fine cuisine and great beer, as well as visiting friends. Ending up in Edita's homeland of Slovakia, they shared many good times along with catching up with all the family. Sweet Home Hall named Chris Rybak "Entertainer of the Year" for 2007 on Dec. 16. , 2007. Chris & Edita accepted the award from Sweet Home Managers Phil & Grace Rogers. Sweet Home Community Center, known as "Music City" to many people across Texas, is a great place to come out and dance, visit with your friends, and enjoy a relaxing evening of music. Join Chris Rybak at his next dance at Sweet Home on Sunday, April 6, 2008 from 2 - 6 pm. September 2007 - Chris Rybak releases NEW CD "Let's Get In The Mood" featuring the Roland Digital Accordion! This album includes a variety of music, from the twin fiddles in "San Antonio Rose", to the clarinet and accordions in "In The Mood", to the ethnic dulcimer in the "Gypsy Polka", and the bagpipe in "Amazing Grace". Emphasized in this recording is the artistic flavoring of digital technology. The CD was recorded in its entirety with only two Roland instruments, the FR-7 V-Accordion (world's first completely digital accordion) along with one of their top of the line keyboard arrangers. Testimonials! Album recorded by Bernard Tupa at CLR Studios and produced by Chris & Edita Rybak. Copyright 2007. Chris one again exhibited "the world's first" completely digital accordion, the FR-7 V-Accordion from Roland, at the Austin Convention Center from July 27 - 29, 2007. Click to watch the accordion video! Chris Rybak travelled up to Chuck Levin's Washington Music Center in Wheaton, MD to perform a clinic. Roland's FR-7 Digital Accordion was featured and Chris demonstrated the unique advantages of this instrument and showcased various styles of music with the Digital Accordion. Chris Rybak performed at Buc Days in Corpus Christi April 25 & 26. From Tex-Mex and Czech Polkas, to Texas Style Country Music, Rybak's show was enjoyed by all. Mark Chestnut liked the accordion music as well and his manager is considering using Chris in future dates. From Jan. 24 - Feb. 9, 2007, Chris & Edita Rybak travelled across Europe, performing and entertaining, as well as visiting family and friends. From Germany and Austria, to the Czech Republic and Slovakia, they took an accordion, skis, camera, and Texas charm with them as they enjoyed the extraordinary hospitality of Edita's homeland. A brand new DVD "Touring With Chris Rybak" is now available featuring movie footage from this trip! Chris Rybak toured with Ben Sustr's Rockin' R group up to Branson, MO during November. While in Branson, Chris performed with Moe Bandy, the Hughes Brothers, as well as at the Yakov Smirnoff Theater and various other stages. It was an exciting time for everyone on the trip. The audiences in Branson appreciated the Texas flavor of music that Chris brought there. 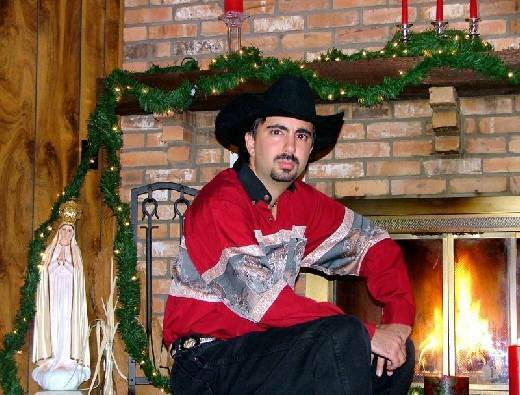 Chris Rybak's first Christmas CD entitled "Christmas Time with Chris Rybak" was released on November 12, 2006. This CD features Christmas favorites such as White Christmas, Rudolph, and Rybak's kicked up version of Feliz Navidad. Also included on this CD is a very touching version of Away in a Manger as well as guest appearances by his wife Edita on Jingle Bells (Rolnicki in Czech) as well as on Silent Night (last verse in Edita's Native language of Slovak). The goal of this CD Rybak says is to "bring the Christmas Spirit back to all my fans". Chris Rybak entertained all 8 weekends at the Texas Renaissance Fest, one of the nation's largest, most acclaimed renaissance theme parks, from September 30 - November 19, 2006. 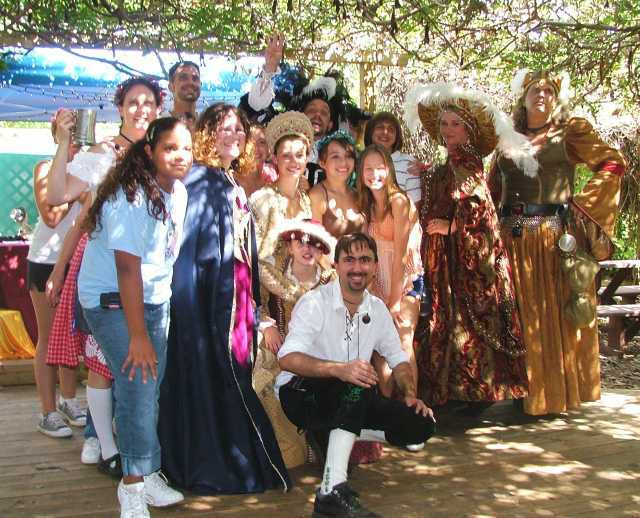 His performances included the Dove Meadow Stage, Arborhaus Family Biergarten, and the New Market Music Gazebo during the Festival's Oktoberfest Themed Weekend Play.